An example of two components expressed in UML 2.0. The checkout component, responsible for facilitating the customer's order, requires the card processing component to charge the customer's credit/debit card (functionality that the latter provides). Component-based software engineering (CBSE), also called as component-based development (CBD), is a branch of software engineering that emphasizes the separation of concerns with respect to the wide-ranging functionality available throughout a given software system. It is a reuse-based approach to defining, implementing and composing loosely coupled independent components into systems. This practice aims to bring about an equally wide-ranging degree of benefits in both the short-term and the long-term for the software itself and for organizations that sponsor such software. Software engineering practitioners regard components as part of the starting platform for service-orientation. Components play this role, for example, in web services, and more recently, in service-oriented architectures (SOA), whereby a component is converted by the web service into a service and subsequently inherits further characteristics beyond that of an ordinary component. Components can produce or consume events and can be used for event-driven architectures (EDA). An individual software component is a software package, a web service, a web resource, or a module that encapsulates a set of related functions (or data). All system processes are placed into separate components so that all of the data and functions inside each component are semantically related (just as with the contents of classes). Because of this principle, it is often said that components are modular and cohesive. With regard to system-wide co-ordination, components communicate with each other via interfaces. When a component offers services to the rest of the system, it adopts a provided interface that specifies the services that other components can utilize, and how they can do so. This interface can be seen as a signature of the component - the client does not need to know about the inner workings of the component (implementation) in order to make use of it. This principle results in components referred to as encapsulated. The UML illustrations within this article represent provided interfaces by a lollipop-symbol attached to the outer edge of the component. However, when a component needs to use another component in order to function, it adopts a used interface that specifies the services that it needs. In the UML illustrations in this article, used interfaces are represented by an open socket symbol attached to the outer edge of the component. 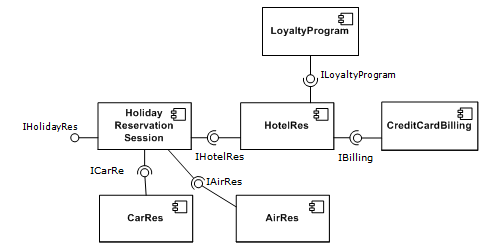 A simple example of several software components - pictured within a hypothetical holiday-reservation system represented in UML 2.0. Another important attribute of components is that they are substitutable, so that a component can replace another (at design time or run-time), if the successor component meets the requirements of the initial component (expressed via the interfaces). Consequently, components can be replaced with either an updated version or an alternative without breaking the system in which the component operates. As a rule of thumb for engineers substituting components, component B can immediately replace component A, if component B provides at least what component A provided and uses no more than what component A used. Software components often take the form of objects (not classes) or collections of objects (from object-oriented programming), in some binary or textual form, adhering to some interface description language (IDL) so that the component may exist autonomously from other components in a computer. In other words, a component acts without changing its source code. Although, the behavior of the component's source code may change based on the application's extensibility, provided by its writer. When a component is to be accessed or shared across execution contexts or network links, techniques such as serialization or marshalling are often employed to deliver the component to its destination. Reusability is an important characteristic of a high-quality software component. Programmers should design and implement software components in such a way that many different programs can reuse them. Furthermore, component-based usability testing should be considered when software components directly interact with users. In the 1960s, programmers built scientific subroutine libraries that were reusable in a broad array of engineering and scientific applications. Though these subroutine libraries reused well-defined algorithms in an effective manner, they had a limited domain of application. Commercial sites routinely created application programs from reusable modules written in assembly language, COBOL, PL/1 and other second- and third-generation languages using both system and user application libraries. As of 2010[update], modern reusable components encapsulate both data structures and the algorithms that are applied to the data structures. Component-based software engineering builds on prior theories of software objects, software architectures, software frameworks and software design patterns, and the extensive theory of object-oriented programming and the object-oriented design of all these. It claims that software components, like the idea of hardware components, used for example in telecommunications, can ultimately be made interchangeable and reliable. On the other hand, it is argued that it is a mistake to focus on independent components rather than the framework (without which they would not exist). The idea that software should be componentized - built from prefabricated components - first became prominent with Douglas McIlroy's address at the NATO conference on software engineering in Garmisch, Germany, 1968, titled Mass Produced Software Components. The conference set out to counter the so-called software crisis. McIlroy's subsequent inclusion of pipes and filters into the Unix operating system was the first implementation of an infrastructure for this idea. The software components are used in two different contexts and two kinds: i) using components as parts to build a single executable, or ii) each executable is treated as a component in a distributed environment, where components collaborate with each other using internet or intranet communication protocols for IPC (Inter Process Communications). The above belongs to former kind, while the below belongs to later kind. IBM led the path with their System Object Model (SOM) in the early 1990s. As a reaction, Microsoft paved the way for actual deployment of component software with Object linking and embedding (OLE) and Component Object Model (COM). As of 2010[update] many successful software component models exist. A computer running several software components is often called an application server. This combination of application servers and software components is usually called distributed computing. Typical real-world application of this is in, e.g., financial applications or business software. A component model is a definition of properties that components must satisfy, methods and mechanisms for the composition of components. During the last decades, researchers and practitioners have proposed several component models with different characteristics. A classification of the existing component models is given in. Examples of component models are: Enterprise JavaBeans (EJB) model, Component Object Model (COM) model, .NET model, and Common Object Request Broker Architecture (CORBA) component Model. VCL and CLX from Borland and similar free LCL library. 9P distributed protocol developed for Plan 9, and used by Inferno and other systems. ^ McIlroy, Malcolm Douglas (January 1969). "Mass produced software components" (PDF). Software Engineering: Report of a conference sponsored by the NATO Science Committee, Garmisch, Germany, 7-11 Oct. 1968. Scientific Affairs Division, NATO. p. 79. ^ a b I. Crnkovic, S. Sentilles, A. Vulgarakis and M. R. V. Chaudron, "A Classification Framework for Software Component Models" in IEEE Transactions on Software Engineering, vol. 37, no. 5, pp. 593-615, Sept.-Oct. 2011, doi: 10.1109/TSE.2010.83. ^ Arad, Cosmin (April 2013). Programming Model and Protocols for Reconfigurable Distributed Systems (PDF). Doctoral Dissertation. Stockholm, Sweden: KTH Royal Institute of Technology. ISBN 978-91-7501-694-8.